“Africa’s Pinochet”: Former U.S.-Backed Chadian Dictator Hissène Habré Faces War Crimes Trial | Democracy Now! attorney with Human Rights Watch. In news from Africa, the trial of Hissène Habré, the former dictator of Chad, began in Senegal on Monday but took an unexpected turn today when it was postponed 45 days after Habré’s attorneys did not show for the trial. Hissène Habré is a former U.S. ally who has been described as “Africa’s Pinochet.” He is accused of killing as many as 40,000 people during his eight years in power in the 1980s. Habré is being tried in a special court established after a two-decade-long campaign led by his victims. In a statement today about the postponed trial, attorney Reed Brody of Human Rights Watch said, “The victims are of course very disappointed, but they have been fighting to bring this case to court for 25 years, and 45 days will not change anything in the long march towards justice.” Democracy Now! recently spoke to Reed Brody here in New York before he left for Senegal for the trail. He has worked with victims of Hissène Habré’s regime since 1999. AMY GOODMAN: As we turn now to news from Africa, the trial of Hissène Habré, the former dictator of Chad, began in Senegal Monday but took an unexpected turn today when it was postponed 45 days after Habré’s attorneys did not show for the trial. Hissène Habré is a former U.S. ally who’s been described as “Africa’s Pinochet.” He is accused of killing as many as 40,000 people during his eight years in power in the ’80s. Habré is being tried in a special court established after a two-decade-long campaign led by his victims. In a statement today about the postponed trial, attorney Reed Brody of Human Rights Watch said, quote, “The victims are of course very disappointed, but they have been fighting to bring this case to court for 25 years, and 45 days will not change anything in the long march towards justice.” I recently spoke to Reed Brody here in New York before he left for Senegal for the trial. He has worked with victims of Hissène Habré’s regime since 1999. I began by asking Reed Brody to talk about the significance of the trial. REED BRODY: This is the first time, actually, anywhere in the world that the courts of one country, Senegal, are trying the former leader of another, Chad, for human rights abuses. It’s the first time that the African Union has established a tribunal. And it’s the first time that the victims of a dictator in Africa have brought that dictator to justice. And as you said, this is the end of a 25-year campaign by the victims to bring Hissène Habré to justice. And so this is going to be a first for many things, and I think, for Chad and for Africa and for justice, in general, it is a big step forward. AMY GOODMAN: Talk about the reign of Hissène Habré, how he came to power, who he was supported by and what he did. REED BRODY: So, Hissène Habré was the ruler of Chad from 1982 to 1990. He was brought to power, actually, by the United States, by Ronald Reagan. It was the first covert operation of the Reagan administration, before the Contras in Nicaragua, before Jonas Savimbi. He was seen as a bulwark against Muammar Gaddafi of Libya, who had expansionist designs on Chad. So, with U.S. and French support, he took power, maintained power, but he turned his country into a police state. It was a one-party system. He is accused of thousands of political killings, of systematic torture. We happened to stumble on the files of his political police, the DDS, in the abandoned offices of the DDS. And in these files alone, we were able to calculate the names of 1,208 people who died in detention or who were killed, of over 12,000 people who were tortured or victims of arbitrary detention. He carried out waves of ethnic cleansing against—first in the south in 1984, then against the Hadjarai ethnic group, against the Zaghawa ethnic group. And he was overthrown finally in 1990 by the current president of Chad, Idriss Déby. So it’s been 25 years since Habré fled to Senegal, 25 years that his victims have been pursuing him. AMY GOODMAN: And the DDS is the secret police? 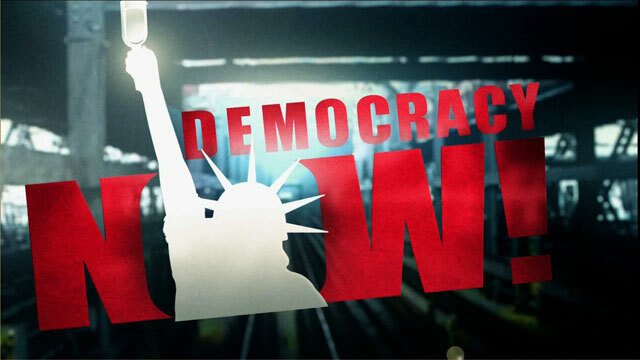 AMY GOODMAN: Whose government was it under in the United States? REED BRODY: This was under Ronald Reagan. And I should say, to its credit, that the Obama administration has been a big supporter of bringing Hissène Habré to justice, has contributed to the court, and the U.S. ambassador for war crimes is coming to the opening of the court. AMY GOODMAN: How did he end up in Senegal, and why have they chosen to try him, and on what charges? REED BRODY: After he was overthrown, he fled—well, first of all, he cleared out the country’s treasury, totally emptied it out. And he went to neighboring Cameroon. And then he was looking—the U.S., in fact, which had supported him to the very last day, was trying to find a place for him that was further away from Chad, and he ended up in Senegal. And the victims began this quest, actually, on the heels of the Pinochet arrest, when the former Chilean dictator, Augusto Pinochet, was arrested in London by—on the warrant of a Spanish judge, Baltasar Garzón, for crimes allegedly committed in Chile. And the House of Lords ruled that he could be prosecuted anywhere in the world, even though he was a former head of state. You know, the human rights movement was in effervescence, and there was this idea of using the international justice system to bring to book people who seemed out of the reach of justice. And it was at that point that the Chadian—a Chadian human rights activist came to us and said, “Well, we have somebody in—who is our Pinochet.” And that was 1999. And we helped the Chadian victims from Chad go to Senegal, where Habré was living, to file the first case against him. And, in fact, Habré was arrested 15 years ago, for the first time, by a Senegalese judge. But he used—in effect, he used the money he had taken from Chad to basically build a network of influence and support in Senegal that blocked the case for over 12 years. And it wasn’t until 2012, when the International Court of Justice ruled that Senegal had to prosecute or extradite Habré, and a new president of Senegal was elected, Macky Sall, that the case got back on track. But during that time, the victims, there was a constant stream of Chadian victims going to Senegal, building support for the case, building international pressure, so that when Macky Sall became president, he felt obliged then to move forward with the case. AMY GOODMAN: I want to turn to another film that was just made, called Talking About Rose, by Isabel Coixet. Can you introduce it for us? REED BRODY: This is actually a remarkable story. When we were interviewing the survivors for the first time, a lot of them, including several women, told us about this woman prisoner Rose, who was like a kind of a guardian angel who would help people out and who would try to smuggle out notes about people being tortured and killed in—other cellmates who were being tortured and killed in prison. And she, herself, was betrayed, and they took her out of prison and executed her. When we found the files of the DDS, we found the last report of her interrogation. And in this interrogation, after she was betrayed, she tells her captors, who write it down—the captors write down—she says she does not regret anything she did. What she did, she did for her country. And even if she dies in prison, history will remember her, and Chad will thank her. And so, this movie is called Talking About Rose, because she said, actually, “History will talk about me.” And, you know, here’s this woman who basically tells her captors, you know, “History will talk about me.” And her captors write it down on a piece of paper that is abandoned for 15 years, and then we find it. “History will talk about me. I don’t care what you do to me.” And this is a movie then called Talking About Rose. AMY GOODMAN: Talking About Rose. It’s directed by Isabel Coixet, the Spanish filmmaker. NARRATOR: [translated] Rose Lokissim was one of the first women in Chad to become an elite soldier. After she joined the opposition to Habré’s dictatorship, Rose was arrested and taken to the terrible prison known as Les Locaux. In 1984, she was put in cell C, known as “the cell of death” because prisoners there, crowded into a putrid, windowless room, died each day. Rose was the only woman among 60 men. FATIME SAKINE HAMADI: [translated] Rose was a good woman. If they tortured here, bound her, whipped her, she wouldn’t even move. She was very courageous. Even when she’d come back from torture, she’d still chat like normal with us, as if she hadn’t seen a thing. A good woman. ASHTA MAHAMAD ALI MONIQUE: [translated] She was with the men for eight months, at the start. They took her out, and she stayed with us women. Then the prison director said, “No, no. That’s no regular woman. If she flees, you will see.” They took her back to the men. She was the only woman with the men. FATIME SAKINE HAMADI: [translated] He was afraid. He said, “That woman is going to escape some day.” He told the DDS that she was going to escape some day. So they put her with the men in cell C. Just one woman, with the men. After eight months, they brought Rose back. She was filthy, smelling, with lice all over, matted hair. So we boiled water and leaves, and washed her hair. The lice were like that. We took them out. We had to get off the crud with a knife. ASHTA MAHAMAD ALI MONIQUE: [translated] Rose was a good woman. In the morning, they made her go throw out the poop. She’d go out cheerily just like a man. It didn’t bother her at all. Rose was really courageous. ALEÏNA N’GOUSSI JACKSON: [translated] She was already a fighter. She knew what she was fighting for. Her philosophy was already in her head. She didn’t like the regime. She did what she could to be rid of it. DOHKOT CLÉMENT ABAIFOUTA: [translated] A woman who didn’t wish anyone harm. She didn’t want to see people suffer. Rose told us, “Stay strong until we can get out of this prison. Then we’ll change the direction of things in this country.” A revolutionary, because she had ideas that fired us up to revolt, to dream of a change. AMY GOODMAN: Talking About Rose, by the award-winning filmmaker Isabel Coixet. Reed Brody is our guest, attorney at Human Rights Watch, who has been one of the seminal forces in the Hissène Habré trial that is just about to take place right now in Senegal. So, this story of Rose is—I can’t say typical, right? Every person is so unique in surviving their imprisonment, their torture. Ultimately, she was killed. But how does this contribute to the trial? REED BRODY: Well, I think, first of all, it brings, you know, a human face. I mean, one of the interesting things about this case is that the victims are the architects of this prosecution. It is not coming down from The Hague, from an international prosecutor, an international court. It’s very difficult for Hissène Habré to pose as the victim here, when there are the faces and the stories of real victims. So, the fact that the victims have played such a protagonistic role in this case, I think, makes it very much more inspiring for victims around the world. And it also makes it much more difficult for Hissène Habré to say, “No, I’m being persecuted by, you know, the international community,” or whatever. AMY GOODMAN: So when does a dictator get tried by the International Criminal Court, for example, and when does something like this happen, a neighboring country actually tries the person? REED BRODY: Well, Habré’s alleged crimes took place before the International Criminal Court was established, so the ICC wouldn’t have jurisdiction over these crimes. I mean, the ICC is a court of last resort. It’s only supposed to kick in when national courts cannot. This case is the first case in Africa going to trial on what’s called universal jurisdiction, which is the Pinochet principle, which says that certain crimes are so heinous that wherever you are, the courts of that country can prosecute you. So if you’re alleged to have committed torture and you come to the United States, the United States, if they don’t extradite you back, is supposed to prosecute you in the United States. AMY GOODMAN: Attorney Reed Brody of Human Rights Watch, talking about the former Chadian dictator Hissène Habré, who’s on trial in Dakar, Senegal. The trial has just been delayed 45 days. We’ll keep following the story.